I have now played with the PL-880 for three weeks. I have bought this radio mainly for LW/MW and I must say that it is a disappointing radio. It lacks sensitivity and its dynamic range is below average. True, the AN-200 passive loop is a great way to boost AM but even on strong signal stations some noise is still noticable. Its sync detector is another disappointment. During deep fades a annoying static is noticable making the sync detection feature totally useless. This static is also present during usb/lsb exalted carrier reception, be it not as bad as with the sync detector switched on. It shines on SW and FM though. It is beautifully made and it will be my companion during travels nonetheless. Pure due to its size. Compared to the older Sangean 909 (so NOT the 909X) the PL-880 is not a better radio, on the contrary. The Sangean has a much better dynamic range. Good sensitivity and selectivity is what we want. Selective the 880 is, due to the number of filters that can be selected, a great feature. And here it outperforms the Samgean but that’s all. So if you’re looking for a good AM/LW receiver, remove the PL-880 from your shortlist. Too bad most manufacturers regard AM/LW to be unimportant. It seems there are no new portables anymore that offer sensitive and selective AM/LW. I appreciate the time and effort put into doing exhaustive reviews of the Tecsun PL 880 and other receivers on SWLing. This is an incredible resource. Thank you! I live in what is almost a Faraday cage, i.e. on the 6/F of a reinforced concrete frame and brick building with a reinforced concrete slab roof immediately above me and abutted by a 25 storey reinforced concrete building to one side, and surrounded by neighbouring buildings ranging from about 20 to 50 stories high…. definitely not the best conditions for listening to Short Wave… yet I found I could pick up a good selection of SW broadcasters, not just loud and clear but in some cases, e.g. VOA, Turkey and quite a few others the signals were so strong it was almost like listening to FM…. as the PRC broadcasters are almost next door as it were and as they broadcast strong signals in a wide variety of languages, I listened til the stations broadcast their identifiers… With all the mixed to bad reviews on the web of this little handheld receiver I must say I am pleasantly surprised. I look forward to comparing the PL 880’s receiving qualities with a regen and other older receivers. Hi and thanks for continuing to report on this great receiver. I have had mine for two years and to help this SSB issue, when listening on the telescopic antenna, this is indeed the best tip. However, the attenuator does NOT seem to work with an external antenna in the jack. So, with some meters of wire clipped to the telescopic, I find the 880´s SSB performance better manageable, in the very way Tudor describes. I believe Tecsun could become a manufacturer of high quality well designed receivers, portable and table ! IF they continue development and employ good engineers, there is a market for quality radios out there and although there will be a price point, very sophisticated components are available and at an increasingly low price. Quality control must improve to deal with issues of sample variation, and the physical body of the radio and controls need to be robust have good feel and be ergonomically astute with logical menus! The most important issue is however to listen to what it is purchasers of these want in a product, something the big Japanese 3 Comms manufacturers have not always done. Consumer expert panels is a good start. My first and only triple conversion receiver was a 1959 Hammarlund HQ-One-Seventy made exclusively for HF ham bands. As for the PL-880, after reading some reviews indluding Jay Allen’s and learning that its Synchronous Detection is mediocre I lost interest. However, one radio I intend to buy and I don’t understand why it is not more appreciated is the PL-680. I read positive reviews and it did very well when compared to PL-660 and PL-880. I also have a SONY ICF-2010 and its synchronous detection proved to be very good at pulling weak MW signals and equally effective at eliminating strong interference from adjacent stations. I recently acquired a Kenwood R-2000 after noticing and then confirming I could listen to weak signals against very high background noise with and old Panasonic DR49 better than with an ICOM R75 equipped with DSP module and other filters. And yes, the R-2000 also beats the R75 (and so does my IC-718). Therefore, my respect for analog and half analog receivers got bigger. It is of little use to have a receiver with plenty of features if it does not do well what is supposed to. In short, I don’t intend to spend a lot of money on a state of the art rig. Instead, I’d rather get the best of my SDRplay RSP2 and have my old 1956 Hammarlund HQ-140-X fully restored. The number of conversions says nothing in itself. Any receiver with a Wadley Loop gets an extra conversion, but it’s just a means of “synthesizing” an oscillator every 500KHz. Starting in the fifties, there were receivers that kicked in a second conversion at the higher frequencies, the SP-600 comes to mind, but it was about better image rejection. Receivers like the Collins 51J line were double conversion, but that was a method for getting more stable tuning, and a more accurate dial, by putting in effect a crystal controlled converter ahead of a receiver that tuned 500KHz. In the sixties, there was a move to higher IFs to get rid of image. But thy used crystal filters, so selectivity could be had. A lot of ham transceivers went to 9MHz, especially easy if they were SSB only. The Heathkit GR-54 general coverage receiver had an IF at 1.682MHz, with a crystal filter. It’s a balance. A high IF gets rid of images, but may not be the best place for selectivity, especially if you want different bandwidths. Some companies, like Drake, went with a 50KHz IF where tuned circuits were good enough, and thus got multiple bandwidths at low cost, but that could add a conversion. Other receivers needed an extra conversion for passband tuning or variable selectivity. Nowadays multiple conversions is about getting around a problem, or adding some feature. The “standard” these days seems to be double conversion. Convert up to a frequency above 30MHz, and have a crystal filter there. This gets great image rejection, and now that synthesizers are cheap, it’s no problem making a stable tuning oscillator at the needed frequencies. But narrow filters are expensive up there, and worse if you want more than one bandwidth, so they then convert down to a lower IF, often the traditional 455KHz. There cheap ceramic filters were available, though maybe they are disappearing now. Every conversion is a liability, since each adds a chance to overload, and more stray signals that may cause spurs. Single conversion is best, but there are always tradeoffs. In the early days of radio, converting down was the only way to go, you needed low frequencies to get gain But other options have been around for sixty years. Other factors kick in, and design decisions are what determines the number of conversions, rather than absolute need. Well I for one am not impressed with SSB demodulation on the PL-880 as it suffers from high distortion. The slow AGC attack of all these Tecsun radios make them rather useless for listening to SSB as the signal level is mostly uncontrollable. Tecsun seems to think that making a portable SW receiver with high sensitivity and poor selectivity is acceptable as most people will only use such a radio for MW/FM/SW broadcast listening whislt ignoring the needs of SSB dxers. Part of the problem is the SiLabs DSP chipset which is notorious for producing artifacts in the recovered audio and widely varying levels of sensitivty – especially with SSB, This can be seen quite clearly with a number of DSP-based portable SW receivers (Sangean ATS-909X, Degen 1103 DSP). Until such problems are fixed I would not touch any SW portable with a DSP chipset. My old Sangean ATS-909 runs rings around the PL-880 and is a far superior product IMO. Dave, I agree that Tecsun still have some work to do on their receivers in the area of SSB. It’s an unpleasant audio experience at times! I’ve been looking for a new affordable portable SW Dx radio. What is there if not Tecsun? Does the fact that Tecsun receivers are compared with the big boys of pro and semi-pro SW communications receivers which after all are in an entirely different price bracket, hardly portable and require external grounds and antennae to receive anything at all tell us something about Tecsun? Is there another manufacturer who produces a noticably better portable General Coverage SW Receiver than Tecsun? This is a serious question and I would really like to know if there is a significantly better current production SW general coverage receiver than Tecsun. >>Is there another manufacturer who produces a noticably better portable General Coverage SW Receiver than Tecsun? I don’t think so, not at the same prices. For better performance, at PL-888 prices, one would have to start considering SDRs, but it’s no longer portable. The SSB issue on the 880 can be fixed by reducing the antenna gain using the switch on the left side of the radio (switching from DX to NORM or LOCAL). By the way, the Sony ICF-2010 suffered from the same issue on SSB. Hello Tudor, I agree that the distortion on the SSB on the 880 gets better when you select lower antenna gain, but it’s not gone entirely. That distortion, by the way, is the only real negative thing I’d have to say about the 880. Otherwise it’s really quite an excellent set. I tend to agree with the first poster “Tha Dood”, its not the number of conversions that neccessarily make a receiver more sensitive, many of the current top line rigs amateur and SW are dual conversion and will perform every bit as well or better as triple or Quad conversions, usually the 4th conversion is for an FM stage . As Icoms engineers state , “double conversion can be more difficult to implement but drastically reduces signal distortion and delivers a higher linearity RF signal” than multiple conversions. Historically more conversions often created a higher noise floor due to more processing electronics in line. I have a Tecsun PL 8800 and like it well for portable use however on a large antenna it’s strong signal handling ability is not as good or as sensitive as my JRC 535, or IC 7410. I also find is also a big difference in the clarity of speech received on the JRC and Icoms when the going gets tough. Icom’s IC 7700 7600 7410, are all double down conversion 9 MHz units also and are very very good. Having said that my Icom R-71a receiver a favourite is triple IF with an extra IF for FM is very sensitive but a bit noisier than my IC 7410 with two stages. The Tecsun is a good well priced portable, but in my opinion is not in the same performance class as more expensive comms rigs on the market today. I agree with all your comments, Ross. Well described! 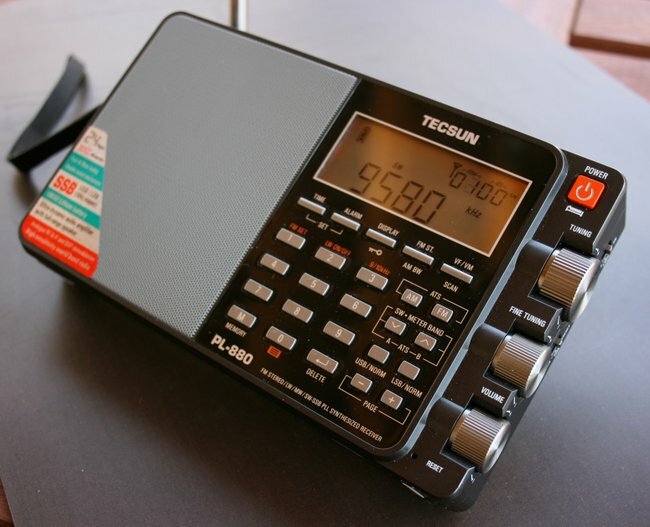 I’m delighted to read another positive review of the Tecsun PL880. I live in Hong Kong and attend the Electronics Fair at the Convention Centre every year. Tecsun exhibit there. So over the years I’ve got to know their staff. Hong Kong is a place with high job mobility, so if staff stay with a company ‘over the years’ it says something about the company. The other day I found myself in Kwun Tong and I went to the Tecsun showroom to say ‘Hallo’ to my friends and feast my eyes on Tecsun products. Needless to say a showroom in a big reinforced concrete building is no place to test a radio…. Back in the early ’90s when I worked with the U.N. at times in remote parts of the world, I treated myself to a Sony ICF 2001D and Sony An-1 Active Antenna for use at ‘home’ – well home for the time being – and a 1st generation Sony ICF 7600 – the analogue version. The 2001D / 2010 is probably the best portable ever. But it is also about 4 times the size of a Tecsun PL660 or PL880 and its fine tuning is only 100hz steps not the amazing 10hz steps of the Tecsun PL880… In the pre-internet days of the early ’90s and in a quiet rf environment – no noise and intereference such as one would suffer in Hong Kong, Manhattan or downtown Chicago – the 2001D / 2010 pulled in signals from all over the world…. Years later I also acquired a Lowe 150 and was able to do side-by-side comparisons between the 2001D / 2010 and the 150, the 2001D / 2010 was better at picking up signals, e.g. the BBC on the 15megs range came in loud and clear on the Sony but was a faint signal on the Lowe…. Well back to my visit to my newly favourite Hong Kong candy store, ahem, I mean SW receiver supplier, Tecsun, I spent a very pleasant hour there and walked away with both the PL660 and the PL880 I have so far only used them in downtown Hong Kong which must be one of the worst places in the world for SW Dx-ing but they both are good at receiving SW BC, and Asia is still a relative hotspot for SW BCs, but on the 880 I’ve also pulled in signals that seem to be from Francophone Africa, so probably West Africa… one Saturday afternoon I did a short side-by-side test of the 660 and 880, I found the 880 is more sensitive and better able to resolve signals, not just weak signals but also to separate signals in crowded bands…. and though I’ve only been able to use the 10hz SSB tuning steps to lock onto CW and rtty, it does that beautifully… whoever heard of 10hz tuning steps in a handheld portable receiver? Oh yes the Tecsun / CountyCom also offers that so I hear…. Tecsun’s staff and management are passionate about their products and about improving their products. They give the impression that their work is not so much a job as a vocation and that is really refreshing. BTW Anon.Co offer great prices and special offers, you won’t get Tecsun / Degen any cheaper from the showroom. They must’ve gone fast at that price as that link doesn’t take you to anything but a few books. Kaito Electronics has it for $159.99 on ebay. Anon-Co still has them on eBay, with an extra battery, for $153.99. And if you have to ship it back to China, that would add other issues, such as cost and lost mail. I prefer analogue to digital and that includes DSP too. Having said that, good for Tecsun for staying in the market, for producing cool radios at comparatively affordable prices and for packing them with features which no other manufacturer of affordable portable receivers currently provides. Vince wrote about having to send items back to China and mentioned the risk of lost mail. While there is always a risk of lost mail…. And yes since 1 July 1997, Hong Kong is part of China (PRC). Agree that the number of conversions only does not mean much. A poorly designed/manufactured triple conversion could be a pain in the neck to adjust. If you’re coming over here again, let me know…. WOW!!! Neat info to know about this portable! I don’t need one, with still a working original Sangean ATS-803A and an AM only Eton E10 portable, and have pre-ordered that Titus II SDR portable, this bit of info, and Radio Jay Allen’s review for AM / FM performance, https://radiojayallen.com/tecsun-pl-880-amfmswssb-portable-radio/ , makes me want to get one even more. Surely it’s not the number of conversions that determines a receiver’s sensitivity? It helps with image rejection and you can get better filter shapes at low IF’s, but sensitivity/noise level is determined up front. That’s what I thought. Glad I saw you comment, as I was about to write the same thing. Triple conversion does nothing for Sensitivity or Selectivity. Some of the most Sensitive receivers are simple Regens (eg zero conversion), and likewise Direct Conversion sets can give the best Selectivity. The big problem with these new sets is the DSP chipset. It does a great job of adding features (eg variable bandwidth) at a rock bottom price, but in real terms it’s performance is quite poor. The reality is that a good DSP set is expensive in both price and power consumption. You can order the Tecsun PL-880 directly from Anon-Co on their website, currently on special for $149.95 with free shipping the US, if you’re willing to wait. Expedited shipping for a small fee. Anon-Co also offers a deluxe version with a digital recorder/speaker, replacement knobs, and a special carrying case for $219.